My new gaming group here in California plays a lot of Warmachine and Hordes. 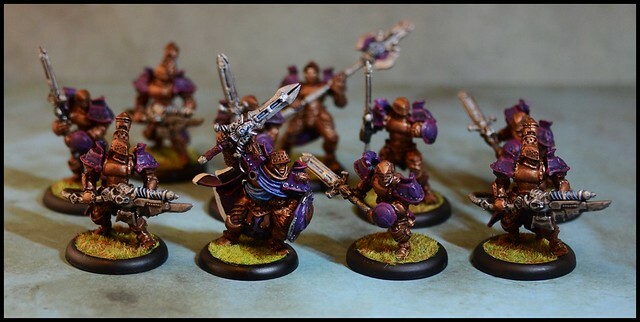 I'd had the bare bones of a Cygnar force lying around, as I do like the steampunk aesthetic of the games. The fact they are smaller, skirmish, type affairs also appealed. I'd just never had a good reason to go out and put together a working force for the game. Now that I do, I picked up a few more models and went about painting up a starting 35 point army. It's probably not the most optimal army just yet, but I've started out well so far ... they are also really fun to paint! Think I might go for some cavalry next ... not sure ... as I'm just starting out there are *lots* of cool Warmachine models that look like they would be fun to paint. Will have to juggle with the Wild West Exodus stuff I already have ready for painting ... more on those soon!